Lime Mortar Plastering | Mathieu & Mitchell Ltd.
Mathieu & Mitchell has carried out an extensive range of projects which has involved the use of lime in mortar or paint. The proper specification for the work, using the correct materials, preparing the surface, mixing, application and aftercare are all equally important elements of any project. The experience and skill of the trade’s person carrying out the work is crucial for the successful completion and longevity of all lime work. Cement is a very good product and has revolutionised the way we build. Solid masonry walls built of stone, brick, straw bales, hemp Crete or other breathable material will only work properly and last if they are plastered /rendered with a lime based mortar. Render is a general term for any type of plaster that is used externally. Renders were traditionally applied to buildings as a weathering coat to protect external wall from exposure to harsh weather and direct damp penetration. They could be used to disguise inexpensive building materials and gave a more refined appearance to a rough stone building. Renders were sometimes treated in an ornamental fashion with quoins or rustication and renders were commonly ruled and lined out to resemble ashlar stonework. Lime renders most of the times were protected/painted with a lime wash.
Lime renders: They are based on lime and sand and were often applied in three coats although sometimes only one or two. They have high level of porosity as well as flexibility. The ratio of lime in the sand should always decrease as we go towards the finish coat. Ruled ashlar: Ruled ashlar imitates finely cut ashlar stone. The fresh plaster is marked with a metal tool .The sub strata behind these renders is sometimes quite crude rubble stone. Again it is worth stating that these renders should not be removed to expose the stone. Wet dash: (also known as harling or rough cast).The final coat of this render consists of coarse sand and a binder, traditionally lime, which was thrown on as a finish. Pebble dash: is a modern variety of render whereby small pebbles are pressed into the final coat of render. As a rule this style of render is inappropriate for use on historic buildings. Roman cement: This natural cement was imported into Ireland during the nineteenth century. It is brown/terracotta in colour and was mostly used for external renders. It is still used today, especially for external coving and ornamental plaster work. It is imported from France under the name “Prompt”. Cement render: Portland cement is made by firing a combination of clay and lime stone. It was developed in 1824 and became increasingly common in the second half of the nineteenth century. These high-strength renders do not have the same levels of plasticity as lime renders, and therefore tend to crack as structural movement occurs. They have lower levels of porosity, so moisture can be trapped beneath their surfaces leading to the breakdown of the render as well as damage to the fabric of the building itself. Water proofing and breathability with lime? The render must help to stop water ingress into the walls but must as well be vapour permeable (it must let the vapour travel freely in and out of the wall).Lime mortar is porous and vapour permeable, It acts like a sponge, absorbing rainfall then allowing it to evaporate rather than soak into the walls. It has the ability to dry as fast as it gets wet allowing any water ingress to be sucked out. Cement render which is not vapour permeable trap moisture in the wall with a potential to create serious problems. Regular maintenance is essential for the protection of renders. Moisture penetration is the problem, and can be exacerbated by the failure and cracking of paint finishes, leakage and spillage from rain-water goods ,and the inadequacy of drips and string courses designed to throw off water. In addition, vegetative growth and in particular ivy can cause renders to break up through the action of their roots and suckers. Painted or decorated renders should be painted on a regular basis, using either a lime wash or else a modern paint that has a high degree of permeability, and should be inspected annually for signs of decay. While the principal cause of decay in renders is excessive water penetration, poor workmanship and inappropriate specification of materials, further damage can be caused by inappropriate modern interventions and methods of repair. This occurs in old renders as a result of structural or thermal movement in the building. New renders can crack and craze as a result of excessive shrinkage where they are allowed to dry out too rapidly, where there is an excessive amount of binders in the mix, or by overworking the mix. Detachment can occur in old renders as a result of water penetration behind the render, and differential thermal expansion and contraction between the render and substrate. In new renders detachment can occur because of lack of adequate key, overworking of the render and excessive thickness of coat. Insufficient or poor quality binder, fast drying where the carbonisation did not happen, frost damage, the use of excessive amounts of water in the mix, efflorescence and salt would dissolve the render as well. Plasticiser or water proofer added to the mix, very damp weather during application or different substrates (brick, stone, concrete). Before specifying any repairs to or replacement of renders, a detailed inspection of the building should be carried out to establish the cause of the defects. Defects may be caused by structural movement or the failure to maintain other parts of the structure. If these problems are not remedied first, any repairs to the renders will be pointless. No render should be removed from the building until this inspection has been completed and an appropriate repair method decided upon. When carrying out repairs it is vital that all materials are like for like. Where localised patch repairs are necessary, it is important that the new renders match the original in terms of strength, porosity and texture. Cement renders should not be used as a replacement for lime renders. Cement render are brittle and will crack as structural movement occurs. In addition they tend to be impervious and can trap water within a building causing the breakdown of the render, and damage to internal plaster finishes as well as the decay of embedded structural timber’s. Where renders are detaching or crumbling, it is general practice to strip the affected areas and then apply a new render to match the original .However, sometimes it is possible to consolidate building renders where they occur on a small scale. This can be done by grouting with a weak lime mortar, using syringes to insert the grout. Render should be given sufficient time to carbonate before painting with any finish that will hinder permeability. It is recommended that lime renders are decorated with permeable finishes such as lime wash to allow the render to breath. It is important to take note of the hardness, porosity and condition of the substrate, consistent moisture levels within the wall, and where the render is positioned on the building. Render should be replaced with lime, and it is recommended that original render mixes be examined and where possible scientific analysis should be carried out to determine the original render mix. It is important that the aggregate is selected carefully in terms of colour, as this will affect the colour of mortars and unpainted renders, and texture when carrying out repairs. Aggregates should be well-washed, well graded, and sharp. Soft fine builder’s sand should not be used for plastering. The proportion of aggregate to binder should be selected carefully as this will determine the porosity and strength of the render once it has hardened. Typical mixes often comprise of one part of lime to three parts sand, but this mix should not be used universally as mixes need to be specified to suit specific situations. Hydrated or hydraulic lime 2, 3.5 and 5 have to be selected carefully. Lime render should not be applied in freezing or wet conditions as this will hinder carbonisation, nor should they be applied in very dry or windy conditions as this can cause the mix to dry too quickly. 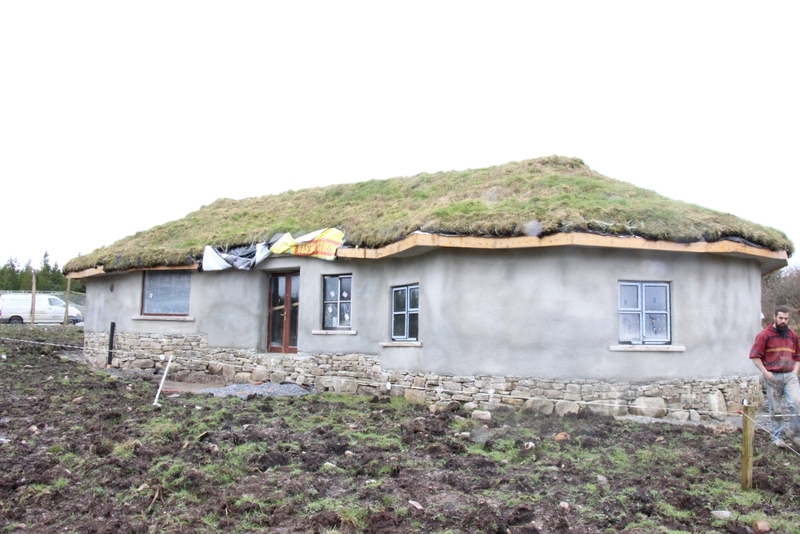 Protection should be given to the newly applied renders in the form of fine nets, damp sacking or polythene while ensuring that air can circulate .It may also be necessary to spray the render occasionally with water to ensure the render stays moist in very dry condition and does not dry too quickly. It should not be applied in overly thick coats, and it is recommended to apply two coats of 10 mm rather than one of 20 mm. Each coat must have properly carbonated before the next one is applied and the succeeding coats should also be weaker than the previous coats to ensure that the moisture can evaporate freely through the render. It is ill advised to remove renders from a building where the substrate material was never intended to be exposed to the elements. This is a major problem in many area of the country. Such buildings were rendered because the underlying masonry has poor weathering capabilities and requires a protective weathering coat. The stripping of renders will seriously alter the character of a historic building, and can lead to serious damp problems which, over time can have severe structural implications.